Coyotes and raccoons appearing to have no fear of humans or large animals are growing in numbers across the Chicago area in recent months, prompting warnings from police and wildlife officials. The latest warning comes from Hammond, Indiana, where police say a resident shared photos of a coyote they say could have a viral disease known as distemper. HOLIDAY — At 6:30 a.m. on a day last November, Wanda Dean woke up to her hysterical and tearful 89-year-old mother. When Wanda went to inspect her mother’s backyard, Morris, the stray cat her mother cared for, was dead. In the weeks before the incident, the mother-daughter duo heard claims from neighbors that four coyotes had built a den on the edge of a golf course less than a mile from her mother’s Holiday home. But coyotes in Florida, especially Pasco County, were a novel idea to them until that day. Last year, Pasco County had 33 coyote-related calls to the Florida Fish & Wildlife Conservation Commission, according to data they recently released. In 2017, the wildlife commission’s Wildlife Assistance Program received 792 coyote calls statewide, nearly 100 more than two years prior. So far in 2018, the program has received eight coyote-related calls from Pasco County. Coyotes are not a new neighbor, officials said. They likely were first brought to Florida in the 1920s to train hunting dogs. The pointed-ear, 20- to 30-pound Canis Latrans was a western species, but expanded its range to north Florida in the 1960s and 1970s, according to the wildlife commission. Pasco and Hernando counties began seeing coyotes in the 1980s, officials said, when the animal’s range expanded rapidly throughout the state. Now, coyotes are considered a naturalized species in all 67 Florida counties. Coyotes have expanded across the nation because of the decline of other predator populations, a wildlife commission spokesperson said, and changed habitats because of urban development and agriculture. While coyotes may be new to some, the wildlife commission said it is common for coyotes to coexist with humans in neighborhoods, especially in urban areas. Coyotes may even help maintain a balanced ecosystem by controlling populations of rodents and other nuisance wildlife. Humans probably can be blamed for the coyote expansion by reducing the animals’ natural habitat, said Raoul Boughton, assistant professor in the department of wildlife at the University of Florida. Yet, urban areas are full of resources for the scavenger animals, he said, including pet food, bird seed, garbage, rodents and stray cats. Reports from golf courses, cemeteries and baseball fields are common, but coyotes go where food is available. That is why residents with small pets must be careful. Coyotes are becoming less afraid of humans, Boughton said, because people keep feeding them. “Most attacks that have occurred on humans have been because a coyote has been habituated to human contact,” Boughton said. Residents should treat coyotes like they would an “unknown, non-leashed dog,” he said. 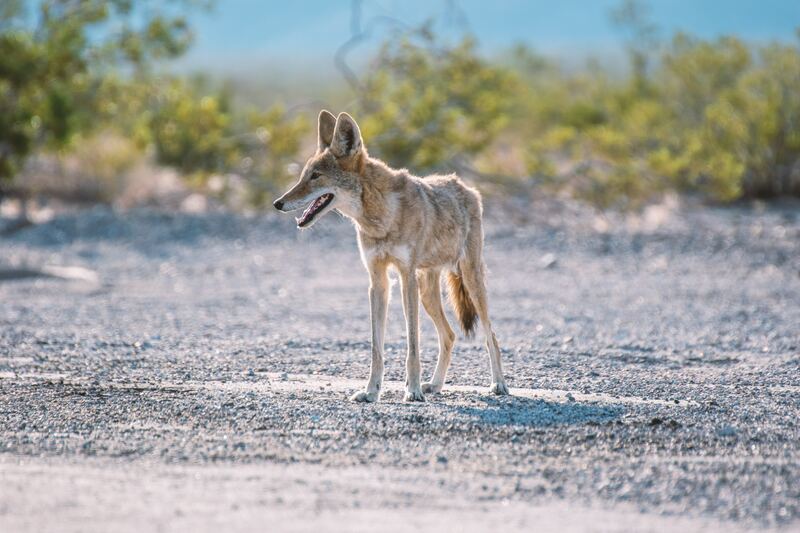 Attempts to remove coyotes are “inefficient and ineffective,” the wildlife commission said, because new coyotes populate where others have been removed. The species can produce more pups per liter to repopulate. For many residents, the coyote presence in Pasco County has been a myth, but Dean wants other Pasco residents to know the threat of coyotes is real. What happened to her and her mother can happen to them and their small pets, too. Contact TyLisa C. Johnson at tyjohnson@tampabay.com. Follow @tylisajohnson. • Never feed coyotes. It is illegal and can cause them to associate people with food and lose their fear of humans. Coyotes are becoming less scared of humans, because people are feeding them. Coyotes will eat dogs, goats, miniature horses, horses, sheep, cows, or ANY farm animal. Wait until the sun is already up before walking the dog in the morning, and in the evening, walk the dog prior to the sun setting. Do not let your dog out in the yard without observation, before sunrise or after sunset. Make sure that your dog will reliably come when he is called. Walk the dog along with other people, and in well-trafficked areas. Remember the times of the year when coyote activity is heightened. That is Feb-May- give or take. Have the pet spayed or neutered – or be sure to keep a super close eye and reliable leash on the animal. Don’t turn your back, and don’t run. They might chase you and they can run up to 40 mph. Blow a very loud whistle. Clap hands loudly and stomp feet. Throw sticks or rocks at their feet. If you don’t have anything available, act large ie. open your jacket, raise your arms and yell. Don’t engage a coyote that is cornered, injured or with pups – instead slowly walk away backwards. Follow all of these tips to keep you and your pet safe. Nuisance Wildlife Removal Inc is fully licensed and insured. We are a locally and family-owned business that has been operating in Manatee and Sarasota county for 20 years. We are the REAL experts with the long term EXPERIENCE that can save you from costly mistakes. Don’t trust your home or budget to a new guy on the block. Call today to speak with a trusted professional. • Secure garbage cans, and clean up pet food, fallen fruit and spilled bird seed. • Walk dogs on short leashes, especially at night. • Don’t allow small pets to roam freely. • During dusk and dawn, be careful taking small pets into wooded areas. And although they don’t typically attack humans, your pets may be at risk. They may view a large dog as a rival, and since a cat is such a small animal, they could be viewed as prey. This would hold true also for small dogs. It is suggested that you should NOT leave your pet out doors unsupervised. The most important times to recognize this are at dusk, dawn or overnight. You should definitely keep cats indoors and dogs on a leash. Your trash should most certainly be kept under a tight lid– and not left exposed in any way to a roaming coyote. If you have any fallen fruit from your fruit trees– that should be picked up! Be aware of any areas you have that they could use as a den. For example close up open areas under your deck. To proactively keep them out– installing a fence is one tactic you could take. Fences should be 6 feet tall, to prevent them from just jumping right over.. and 18 inches deep to keep them from digging underneath. If you encounter a coyote, here is an example of hazing. Coyotes were considered a western species in the US, but expanded their range to north Florida in the 60’s and 70’s according to the wildlife commission. The wildlife commission states that it is now common for coyotes to co-exist in neighborhoods due to the decline of any predator populations. Humans, are most likely to blame for the coyotes expanding their territory as we have reduced their available natural habitat. Keep in mind that urban zones are typically filled with easily available food resources. So for a coyote who is ready to consume just about anything, why hunt for food? Scavenging is much easier. Coyotes are not known to be aggressive toward humans. Always remember that a coyote is a wild animal. They are not domesticated and therefore it is very difficult if not impossible to say with certainty about their behavior. Coyotes are known to attack dogs, sheep, and other livestock, so yes they can and will bite. Coyotes attacks on humans are uncommon and rarely cause serious injuries. The overarching problem is that any animal, if it loses its fear of humans, can act more and more aggressively. It is impossible to know what any given coyote’s exposure to humans has been. So, therefore, it is best to consider any sightings with the utmost of respect– Know where the spatial boundaries are and stay well within them. Never ever feed or pet a wild animal. Coyote in a neighborhood yard. If a coyote was cornered, or also if there were pups around– it is much more likely they would get aggressive. Typically however, if given space the animals will run away to avoid rather than getting into a fight and risking an injury making them vulnerable. FOR COYOTE TRAPPING AND REMOVAL IN MANATEE/SARASOTA CALL 1-866-263-WILD! Do you have concerns about COYOTES in your area? Nuisance Wildlife Removal Inc. is your expert for COYOTE removal in MANATEE/SARASOTA County. Call today to speak with a trusted professional. We are locally owned, family operated and fully licensed and insured. For more information or a FREE estimate call 1-866-263-WILD or 941-729-2103. Or easily contact us by clicking here. What Do You Do if You Encounter a Coyote? If you haven’t heard yet…. as we are moving into their forested areas.